Clare McHugh is a senior at Penn State in the College of Engineering pursing a dual degree in Biomedical Engineering and Mechanical Engineering. Clare joined State of State her sophomore year as a member of the Special Events (now Community Engagement) committee. The following year, she served as the Special Events Director and will be serving as the Executive Director of State of State 2019. Inspired by the mission and goals of State of State, she is eager to facilitate growth and change in the organization. In addition to State of State, Clare is a member of Penn State's Lion Ambassadors and serves as College of Engineering Career Envoy and a Women in Engineering Program Facilitated Study Group Facilitator. Aside from those involvements, she is also involved on a research lab on campus in the Department of Biomedical Engineering. This past summer she worked on furthering that research as a research assistant in the Artificial Heart and Cardiovascular Fluid Dynamics Lab. Next year, by expanding the reach of the organization and making valuable changes, she hopes to create meaningful dialogue on Penn State's campus and throughout the community. ​Feel free to contact her at psustateofstate@gmail.com. 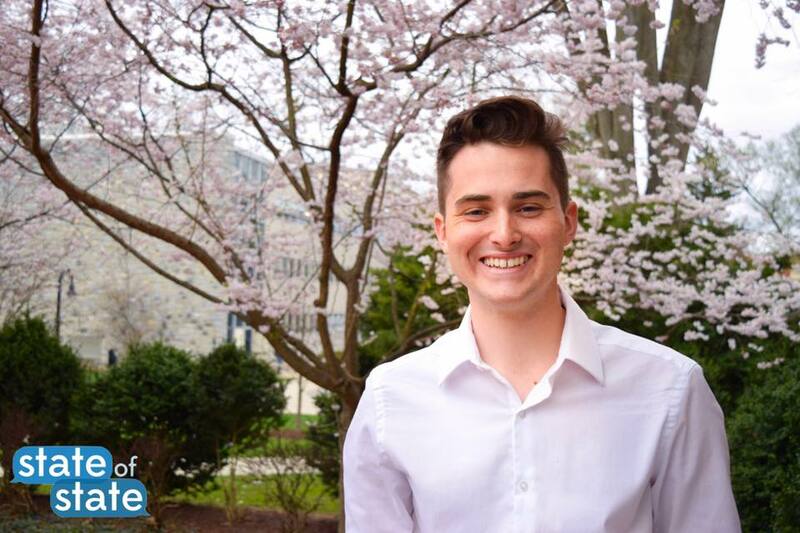 Tom is a senior majoring in Economics and Political Science, and is a member of both the Schreyer Honors College and the Paterno Fellows Program. Tom spent last year as a member of the Content Committee, and this year he will serve as the Content Director for State of State 2019. Outside of State of State, Tom is very involved in the Penn State community, serving as Executive Director of the 2019 Class Gift Campaign, a Lion Ambassador, a member of the Presidential Leadership Academy, and a member of the Political Science Honors Society. Tom spent the past summer interning with the Director of Volunteer Programs in the Division of Development and Alumni Relations. Upon graduation, he plans on going to law school, and go on to work for the United States Government. His main goal for State of State 2019 is to attempt to bring in an Alumni Speaker, to showcase the idea that involvement with Penn State is a lifelong commitment. He would love to connect with anyone interested in assisting with the content of the conference, or to hear constructive feedback or advice on past and future conference. Feel free to email Tom at content.stateofstate@gmail.com. Rachel Chormanski is a sophomore at The Pennsylvania State University. She is currently a double major between Philosophy and Political Science and Paterno Fellows Aspirant with intentions to continue her education after her undergraduate degree. She has always been passionate about learning, reading, and human communication, and it has instilled in her a dedication to always continue exploring the world and helping others have the same ability for adventure. Her intentions involve using her studies on reason, humankind, and politics to empower and educate those who may need it. She has found a passion for conversation as a way to go about achieving these values in an effort to eradicate ignorance and hate. She joined State of State as a way to organize the conversations going around on campus and have the ability to lead those conversations towards positive outcomes. Since then, her involvement with State of State has given her responsibilities and opportunities to prove herself as a leader in terms of integrating positive communication within the community. Her goal is to leave this organization and university better than when she joined, even if she only changes one person. State of State exemplifies the idea of words having a ripple effect through the community and reminds her that we should strive to fight for important issues through thoughtful dialogue. ​Feel free to contact her at engagement.stateofstate@gmail.com. Caitlin is currently a junior majoring in Pre-Veterinary and Biomedical Sciences. She will serve as a Director of Operations for the State of State 2019 conference. She loves State of State because it allows students to have a platform unlike any other to discuss issues they are passionate about on campus. She was on Community Engagement committee last year. Her job was to plan small events throughout the year to facilitate conversation outside of the main conference. Outside of State of State, she works in a research lab in the Veterinary and Biomedical Sciences department. She is also a Little International Beef Heifer Showman and tutors a few people in Organic Chemistry. She loves to paint, draw, and read. Also, coffee is a BIG passion of hers. She also used to play soccer for 10 years! This summer, she is working in Washington DC as a vet tech for an animal clinic. ​Feel free to contact her at operations.stateofstate@gmail.com. Taylor is a junior at Penn State University Park majoring in food science. She will serve State of State 2019 as one of the Public Relations Directors. Taylor joined State of State her sophomore year and was a member of the Production Committee, where she helped make videos for State of State and organize day of conference audiovisuals. Outside of State of State, Taylor spends her time on multiple food product development teams working with companies like Hershey and Ocean Spray. As well, she serves as the technical chair for North Halls Association of Students, the service chair for EARTH House, and the IFT chair for Food Science Club. As PR Director, she wishes to help spread information about important topics that are occuring on the Penn State campus by promoting videos of Penn State community members and State of State’s mission through the State of State’s website. If Taylor isn’t updating the State of State website, you would most likely find her either making food with her friends, shooting some photography, or doing some sort of research within the food science labs. ​Feel free to contact her if you have any comments or queries at pr.stateofstate@gmail.com. Anastasia is a senior majoring in Telecommunications and minoring in Political Science from Waymart, Pennsylvania. Anastasia started on the Production Committee, where she filmed and photographed the conference for two years. Moving to serve as the PR director last year. She is finishing her career at Penn State being the Internal Director. She hopes to continue the important conversations happening within State of State and on campus. She also wants to strengthen the bonds of the organization through committee engagements. She loves State of State because it allows a space for opinions. She says we give a platform to students to speak about issues that are near and dear to their heart. We are such a welcoming organization with big dreams. And we aren't afraid to start important conversations. When Anastasia isn't busy with schoolwork, you can usually find her curled behind her laptop listening to Broadway musicals, specifically Hamilton, sipping iced tea. She is a junior double majoring in International Politics and Security Risk Analysis. Leila joined State of State 2017 as a member of the special events-community engagement committee. This year she will be serving as a Community Engagement Director of State of State 2018. In addition to State of State, Leila serves as the Public Liaison for 'Hope Here Hope Now', and is a member of ASA and Black Caucus. Her goal after graduating is to hopefully work for a non-profit or international organization that works to help refugees or people who do not exactly have the resources or platform to speak up for themselves. She is extremely passionate about social work and social justice, and believes that everyone has a right to be heard and listened to. 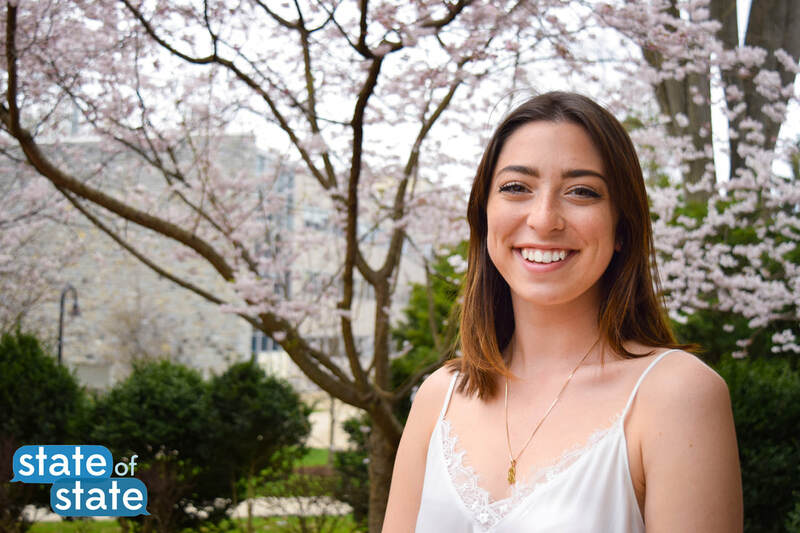 She hopes to encourage growth of State of State at PSU, and she hopes to open up conversation about different issues that affect different groups of people on campus and in our community. Panini is a junior studying International Relations and Spanish. Her freshman year she was on the special events community and her sophomore year she served as one of the partnerships directors. Her biggest goal for State of State 2019 is to expand community engagement with the conference. Most years the same people attend the conference and she wants to expand that base to include a more diverse representation of the student body. Outside of the classroom she is involved in THON and PALS, an organization that serves the Down syndrome community. Sophia is a junior in the Schreyer Honors College majoring in Economics and International Politics and minoring in Spanish. She is one of the Partnerships Directors for State of State for the 2018-19 year after being on the content committee for two years. She sees State of State as a way to start the discussions we need to have in order to grow as a university and as people. Her goals for State of State 2019 are to maintain and grow financial relationships with on and off-campus organizations. Additionally, she wants to focus more on connections downtown as our organization works to integrate State of State with the off-campus community. Outside of State of State, she is involved in Lion Ambassadors, THON, Alpha Delta Pi sorority, and serves as the Vice President for her youth group and an undergraduate teaching assistant. In her free time, she loves to hang out with friends, practice yoga, and go to restaurants downtown. If you need to find her, she's probably indulging in a huge bowl of ramen at Tadashi. ​Feel free to reach her at partnership.stateofstate@gmail.com. Elizabeth is a rising junior at Penn State majoring in Marketing with a minor in Health Policy and Administration from Bethlehem, PA. This is her first year involved with State of State, but she is excited to be a part of the organization as one of the Partnerships Directors for the 2019 conference. Outside of State of State, she served as a Donor and Alumni Relations Development Captain for THON 2018. She is also one of the THON Chairs for her sorority, Delta Zeta. Previously, she traveled to New Orleans, LA on a Service Immersion Trip to assist in areas impacted by Hurricane Katrina. In addition, she worked as a development and fundraising intern for the Pediatric Cancer Foundation of the Lehigh Valley, inc. This summer, you can catch her walking around campus as a Summer Tour Guide for Penn State Undergraduate Admissions. Feel free to contact her at partnership.stateofstate@gmail.com. Zoë is a sophomore at Penn State University Park majoring in marketing in the Smeal College of Business and minoring in psychology. She will serve State of State 2019 as Public Relations Director. She joined State of State her freshman year and was a member of the Public Relations Committee, where she worked on State of State's social media pages. Outside of State of State, she is the manager of the D1 Penn State Women's Tennis Team. She has an internship with the Penn State Sports Psychologist next year, and she will serve as secretary for the Penn State Club Tennis Team. She is also a member of the Penn State Marketing Association. She hopes to increase State of State's following so more students can take part in and be aware of State of State's meaningful dialogue occurring on campus. When Zoë isn't working on State of State or schoolwork, catch her either on the tennis court or reading a book at her favorite downtown cafe. Feel free to reach out to her at pr.stateofstate@gmail.com​.